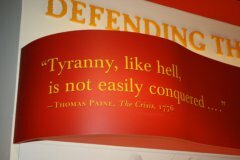 Marine Corps Museum Proves that Marines are "Semper Fi"
Been to the Marine Corps Museum? Maybe not, but I bet you've seen it. What does this building have to do with Iwo Jima? Driving north on I-95, 30 minutes south of Washington, DC, you'll see the often-overlooked museum (also known as the National Museum of the Marine Corps) looming over your passenger side window. Drive on by, and you'll make a huge mistake. That's because this huge conglomeration of metal and glass (which either looks like the prow of a ship or a building site gone wrong) houses a fabulous, but often-overlooked, treasure. 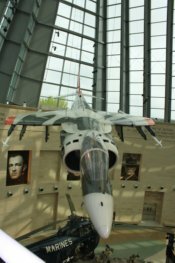 Located in Triangle, Virginia, this detailed and riveting museum is like a letter of thanks to thousands of brave men and women who have served our country for nearly 240 years. The architecture of the museum is striking. Walking through the tunnel-like entrance, you find your eyes immediately lifted upward as you step into the huge, three-story, glass-enclosed Leatherneck Gallery. This is the “prow of the ship” you see from I-95, but it’s not a prow at all. Instead, it is meant to represent an iconic image most associated with the Marines: The image of the men raising the flag over Iwo Jima during World War II. Inside, Marine aircraft--including World War II Corsair fighters and an AV-8B Harrier “jump jet”-- appear to soar above you, while a few full-scale recreations (such as Marines jumping on a helicopter) bring you into the action. Surrounding the gallery are the exhibits which fan out around it and wind in and out of the hill, packing a vast amount of displays, artifacts, mini-movies, and sensory experiences. Galleries are divided into war eras, like “Defending the New Republic,” World War I, World War II, Korea, and Vietnam. Checking out the exhibits in the soaring Leatherneck Gallery of the Marine Corps Museum. The birth of the Marines dates back to 1775, when the Continental Congress authorized two battalions of Marines to fight the British. According to legend, Captain Samuel Nicholas began recruiting the first Marines at Philadelphia’s Tun Tavern. The Marines made their first amphibious landing in the Bahamas in 1776. In the early 1800s, President Thomas Jefferson sent Marines to fight the Barbary pirates off of North Africa. Nearly 600,000 Marines served in World War II; nearly 25,000 died in that war. Full-scale jets soar above you. One highlight for us was at the Iwo Jima exhibit, which includes a movie that simulates how things would have looked had you been part of the invasion force. On the day we visited, a veteran of the Iwo Jima landing was there to share his experience of that fateful invasion from February to March, 1945. We easily spent three hours at the museum. They have an extensive gift shop where you can buy anything from books to Marine commemorative pins, and from Marine-related toys to camouflage backpacks. You can even have personalized dog tags made while you explore the museum. The Marine Corps Museum has two restaurants. The self-serve Mess Hall offers typical cafeteria fare like pizza, hamburgers, soup, and French fries, as well as healthier options like salads, yogurt, and pretzels and hummus. If you want ambiance, choose the adjacent Tun Tavern restaurant, which is modeled after the original Tun Tavern in Philadelphia. Or, bring a picnic lunch to enjoy at the museum’s Semper Fi Gillis Memorial Park, which offers several trails and a playground. 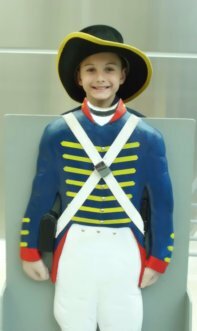 Look for great photo ops for kids in the Leatherneck Gallery. 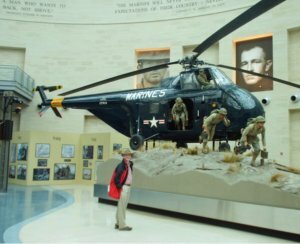 The Marine Corps Museum is probably best for kids ages 7 and up due to some subject matter, although the Museum is currently at work on some areas geared to preschoolers and toddlers. Currently, they offer a Gallery Hunt for kids ages 4-10, and a family activity day (featuring crafts, movies, and puppets) on the second Saturday of each month. Older kids will be captivated by the unexpected—such as a huge tank looming over you as you turn a corner, or a life-size diorama of a Marine camp under siege during the Korean War, complete with bombing sounds and light effects. 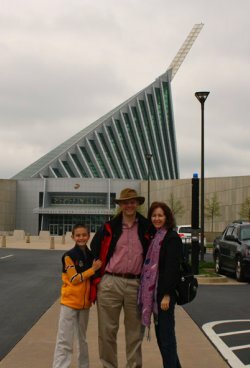 The National Museum of the Marine Corps is located off Exit 150A, just off I-95 in Triangle, Virginia, about 30 minutes south of the center of Washington DC. The museum is open from 9 am to 5 pm every day except for Christmas Day. For more information, go to info@usmcmuseum.org. Looking for More Free & Cheap Things to Do in Washington DC? One of many patriotic signs at the museum. So much of Washington DC can be seen for absolutely nothing! You just need to know where to go. To see my top picks for free things to do in the Washington DC area, go to my Free Washington DC page.